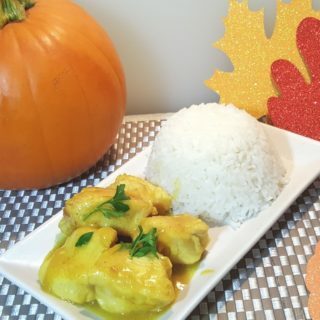 Pressure Cooker Pumpkin Curry Chicken is tender and succulent with a creamy pumpkin sauce. It’s a Fall feeling, with just a touch of curry. Fall is the time of year for all things Pumpkin! 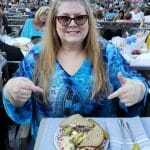 The crisp air, the flavors of Autumn, the wonderful smells, puts a smile on my face. We keep scented pine cones by our front door and the house always smells amazing. I love to cooking food with wonderful aromatics. Pumpkin Soup is so popular this time of year and I set out to make something a little different in my Pressure Cooker based on my Pumpkin Soup recipe (not yet posted). 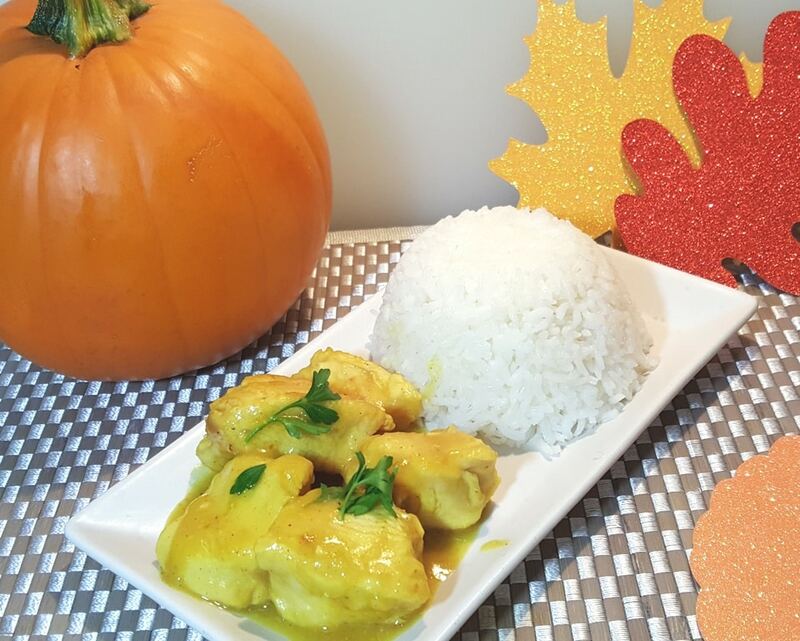 This Pressure Cooker Pumpkin Curry Chicken is the result. The smell is amazing and the chicken is soft, tender and succulent. You don’t believe me, do you? 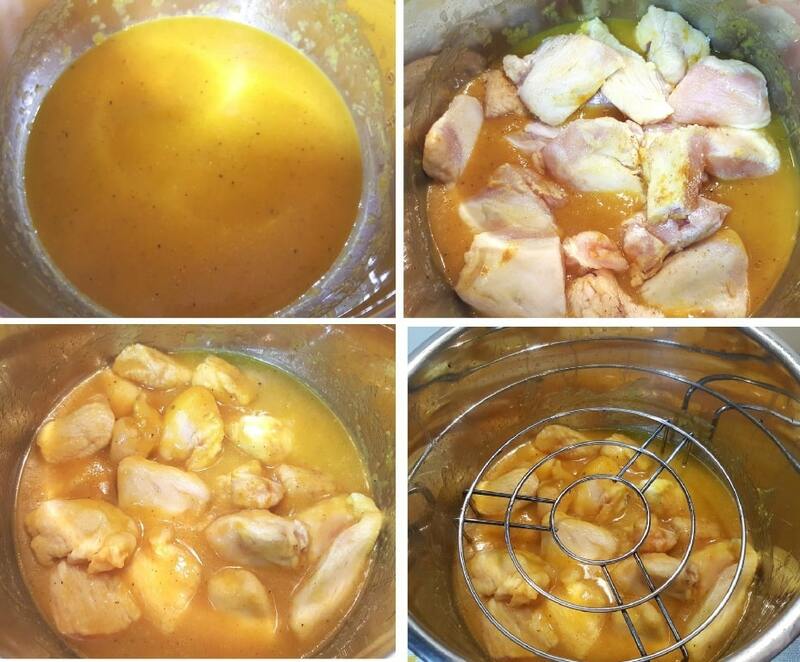 Succulent Pressure Cooker Chicken….impossible, unheard of. My method of cooking chicken in the Pressure Cooker always yields succulent chicken. For those who don’t fancy the Curry flavor, the Curry can be omitted completely and you will still have a delicious and fragrant meal. I always have a wonderful supply of homemade Pressure Cooker Pumpkin Puree in my freezer. It is so easy to make and store. A can of Pure Pumpkin Puree can be used in its place. Just remember, that the Canned Pumpkin is very processed and may have more liquid than fresh. However, if you process a bunch of Pie Pumpkins and use a Foodsaver, you can have homemade Pumpkin Puree all year round! Pumpkin is the star of this recipe and it shines. The amount of spices used is minimal to give a stronger pumpkin flavor. If you want more of a Curry flavor, just up the amount of seasonings. Alternatively, if you want a more traditional Thanksgiving flavor, try using a touch of Cinnamon, instead of the Curry spices. This recipe is totally not an Old World “authentic” Indian recipe. It is light and fun and will give you a sense of Indian flavor. 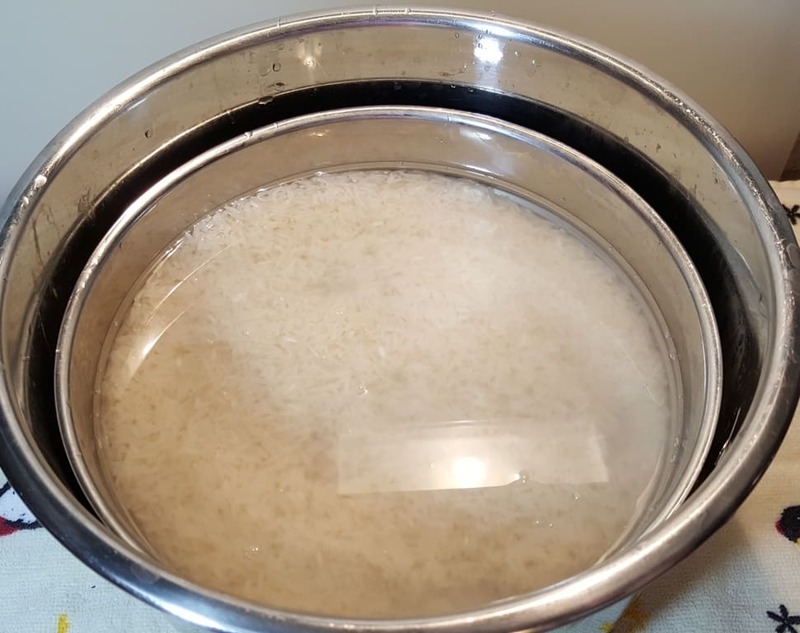 If you would like to cook your rice at the same time and in the same pot with your Pressure Cooker Creamy Pumpkin Curry Chicken, please check out my Pressure Cooker Perfectly Cooked Pot In Pot Rice recipe for step by step instructions. If you prefer potatoes instead of rice, just use quartered potatoes instead of rice. 🙂 Easy, peasy. 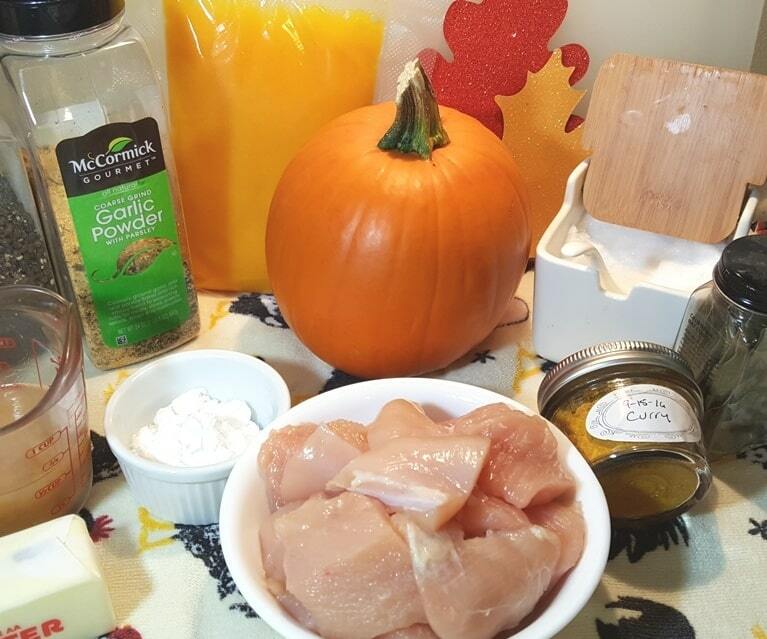 Turn this Pressure Cooker Creamy Pumpkin Curry Chicken recipe into a one pot meal! You will just need these two accessories. One Round Stainless Steel Pan and a Tall Legged Stainless Steel Steaming Rack/Trivet. A delicious and authentic Indian Recipe is my Pressure Cooker Indian Butter Chicken and my Pressure Cooker Chicken Tikka Masala. If you prefer a bread over rice, try my Authentic Indian Naan recipe or my Authentic Indian Chapati recipe. Both can be made with leftover Whey from Instant Pot Greek Yogurt and both can be proofed in the Instant Pot DUO! Start with very dry chicken. 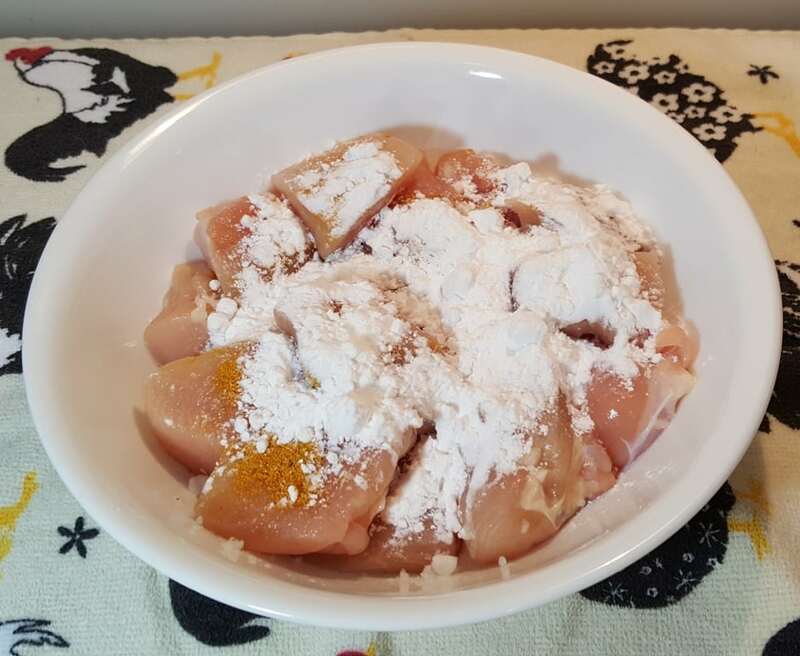 Add your seasonings and mix to coat all the chunks of chicken. 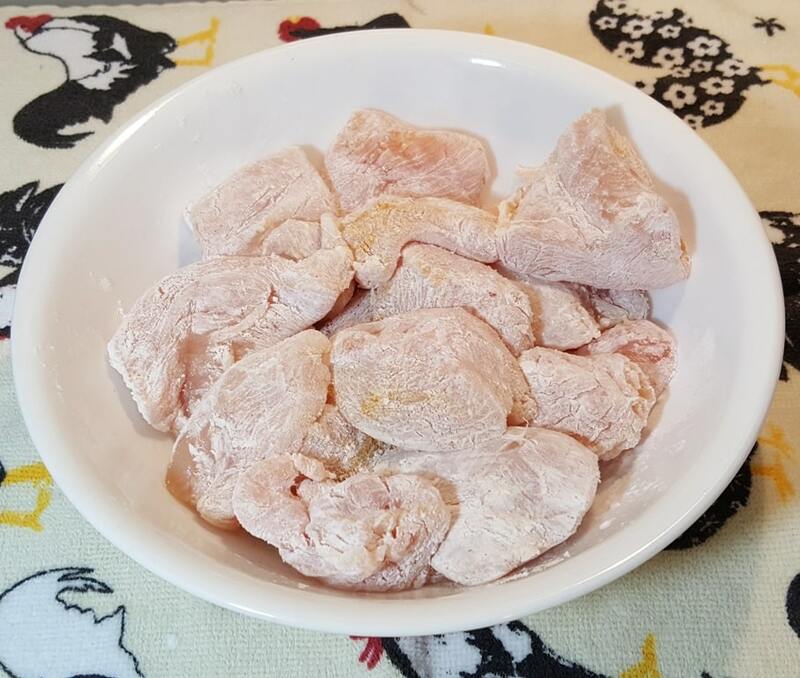 Add Potato Starch to your chicken chunks. 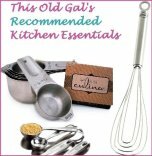 I love to cook with Potato Starch, rather than cornstarch or flour. The taste is better, it’s light and I feel it does a terrific job. The Potato Starch helps tp seal in the juices and will provide some thickness to the sauce, without having to make a slurry. Your chicken will end up juicy and very tender, using this method. 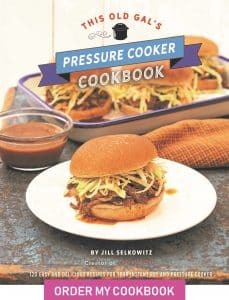 I use this same method on my Pressure Cooker Chinese Orange Pepper Chicken. Make sure your hands are very dry and coat the chicken well. I use Tongs to move the chicken around, so that the Potato Starch won’t stick to my hands. 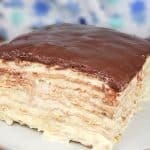 You want a very light coat, so that you don’t end up with a sticky mess that will adhere to the Pressure Cooker cooking pot and cause an overheat error. 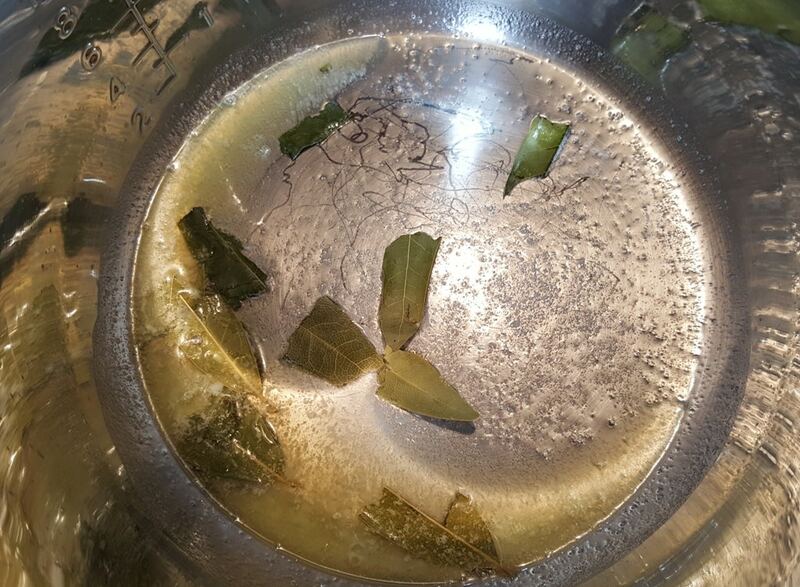 If you are using Curry Leaves or Sage Leaves fry them up in the Homemade Simple Ghee Recipe or Coconut Oil. To make a stainless steel pot, non-stick, make sure to always heat your Pressure Cooker completely and then add your oil/fat. The oil needs to be added to a hot pot. If you add oil to a cold pan, your food WILL STICK and you will get an overheat error message. Once the display on your Instant Pot or Pressure Cooker reads “Hot,” use the tongs and add the chicken to your Instant Pot or Pressure Cooker cooking pot. If you don’t have a display, just wait several minutes to make sure your pot is very hot. 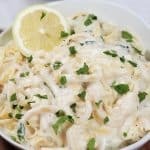 Shake any excess Potato Starch from the chicken pieces before placing them into the Instant Pot or Pressure Cooker cooking pot. Add some spices to your Homemade Pie Pumpkin Puree and set aside. 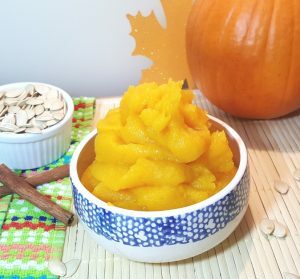 Canned Pure Pumpkin Puree is not as solid as homemade. Without over crowding your Pressure Cooker cooking pot, lightly and quickly brown the chicken in batches and then remove to a plate. Just give them a quick little sear. They don’t need to be a dark brown color. Note the little amount of Potato Starch on the chicken pieces. Don’t forget to shake off the excess Potato Starch . 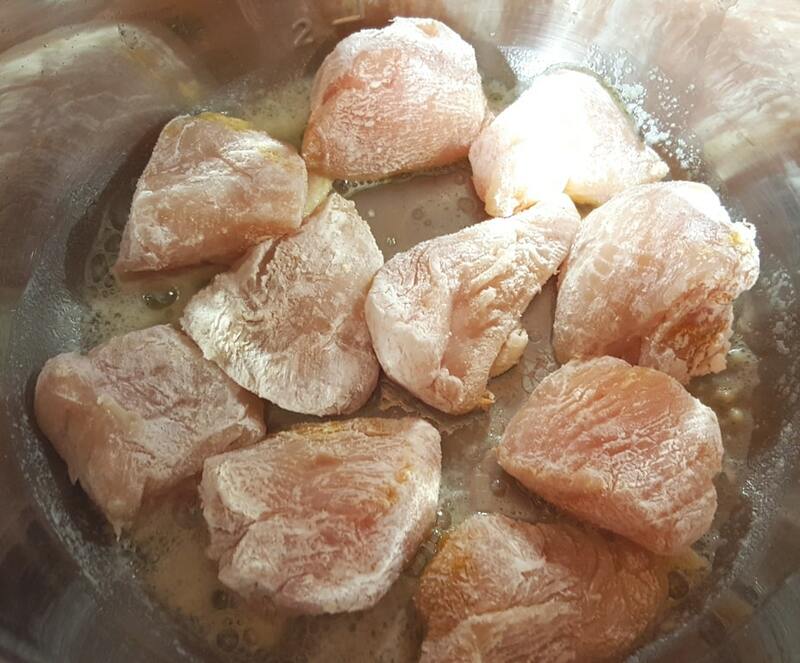 This step of searing the chicken using Potato Starch, will guaranty you a very juicy and tender piece of chicken. Your chicken will not be rubbery, tough or dry. 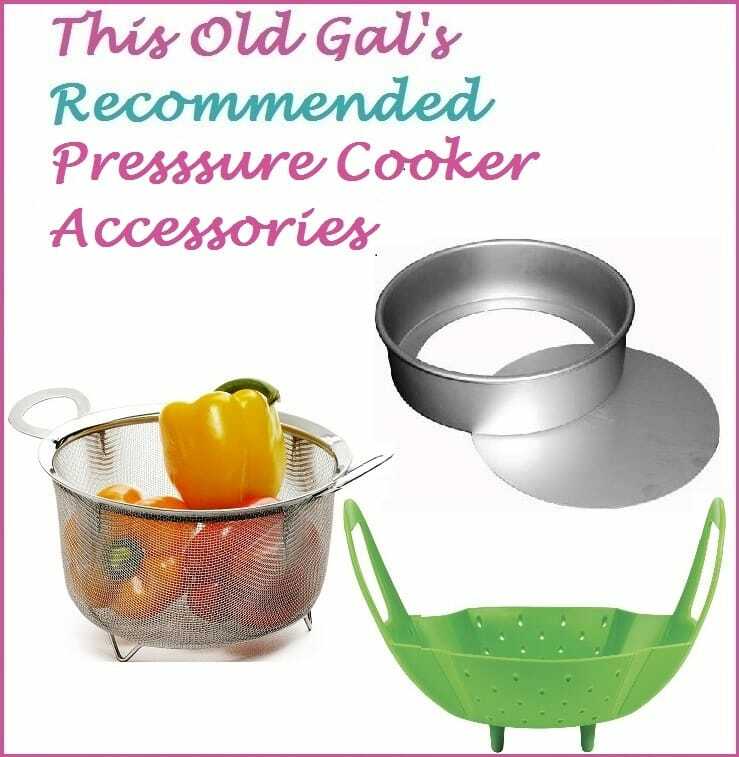 It is a quick extra step that I like to use when cooking chicken in my Pressure Cooker. Add your Pumpkin Puree and a little of your Chicken Stock and deglaze the pan. Cook the pumpkin for a few minutes in order to wilt the garlic and toast the seasonings. When your Pumpkin Sauce becomes fragrant, it is time to add the chicken. The Pumpkin Sauce will be luxurious. Mix in the Maple Syrup and then return the chicken to the Pressure Cooker cooking pot. Add in the rest of the Chicken Broth. If using your own Homemade Chicken Bone Broth, use half Broth and half water, since the Homemade Chicken Bone Broth is so thick. If you are making this a One Pot Meal using my Pressure Cooker Perfectly Cooked Pot In Pot Rice recipe, add your Tall Legged Trivet and Rice now. Place the Stainless Steel Pot in Pot Pan of rice on top of your trivet. You are ready to lock on the lid and cook your entire dinner in ONE pot at the same time!!! Open the pot and remove the Pan of rice. Place the lid on top of the rice to allow it to continue to steam and finish the cooking process. 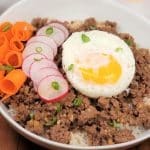 While the rice is steaming, go on to the next step. 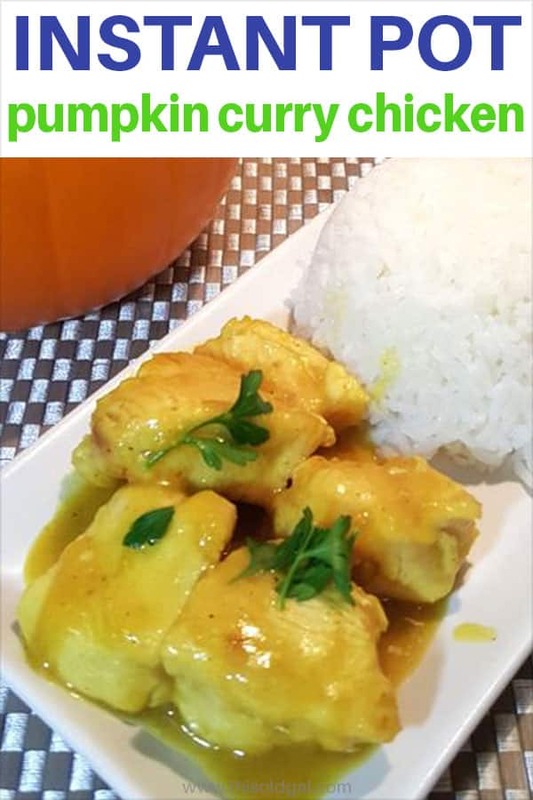 Your rice will be perfectly cooked by the time the Pressure Cooker Creamy Pumpkin Curry Chicken is ready. This recipe is not a proper Indian Curry recipe. It’s not Thai and it’s not Chinese…… it is just me playing around with a Blended Curry Powder Mix and fall spices. I happen to love all kinds of Indian Curries (especially vegetarian), so I made up this recipe so that you have an option to have a little Indian flavor or more of a Fall Pumpkin flavor. 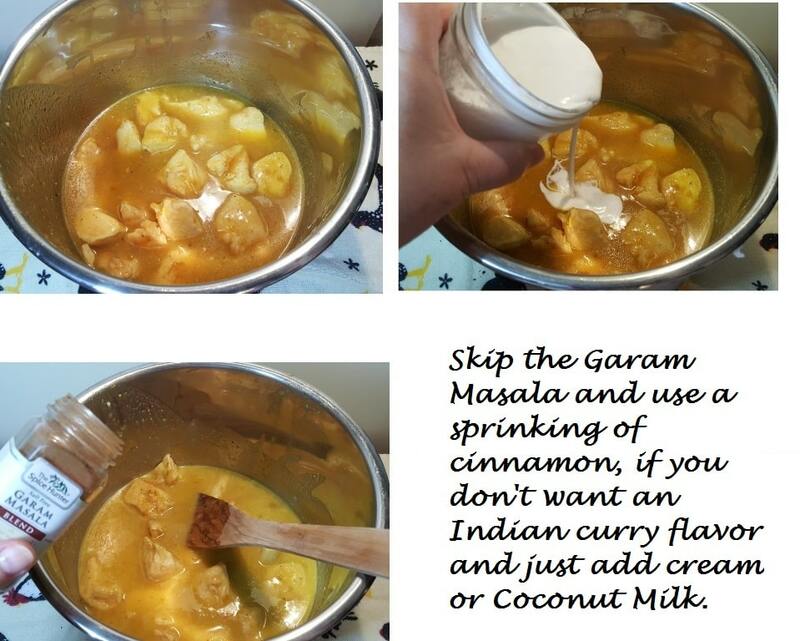 You don’t have to use Garam Masala. For a more traditional Pumpkin Soup flavor, use Cinnamon, instead. Your choice. Simmer the sauce just a bit to thicken it up and then add Coconut Milk, Heavy Cream, Half & Half, or nothing. Taste it and adjust the seasonings to your liking. Serve this Pressure Cooker Pumpkin Curry Chicken with my Pressure Cooker Triple Coconut Rice or Pressure Cooker Garlic Whipped Potatoes. 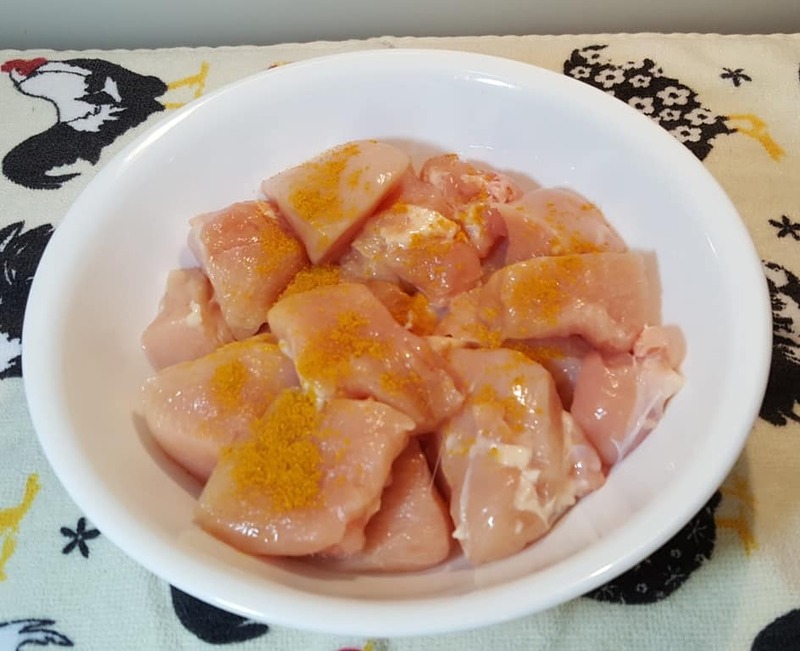 Add chunks of chicken to a bowl and sprinkle on 1 teaspoon of curry powder. Then sprinkle on Potato Starch and make sure all pieces are coated. Shake off excess. Heat Pressure Cooker cooking pot until completely hot. Add Ghee/Coconut Oil and fry curry leaves, if using. 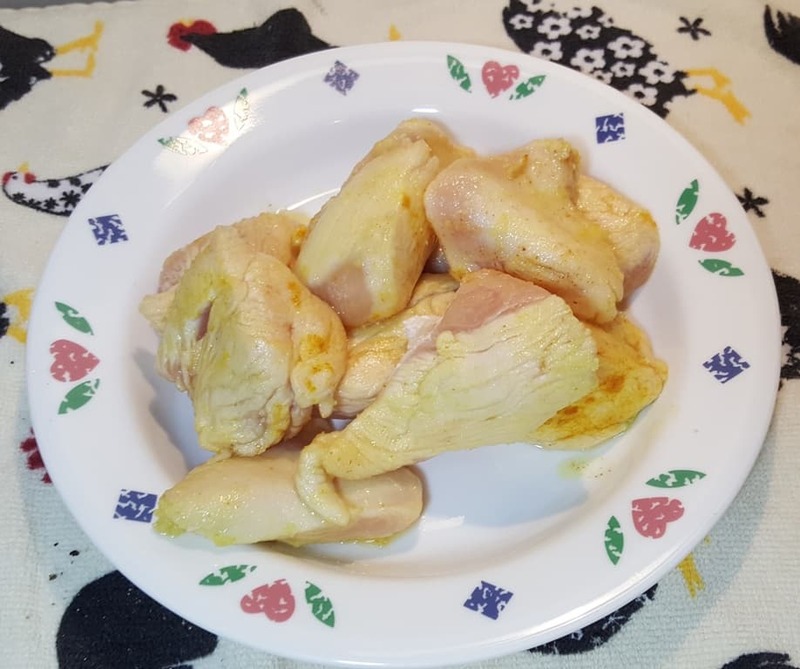 Lightly brown chicken pieces on all sides and remove from Pressure Cooker. Deglaze the cooking pot with 1/2 cup chicken stock. 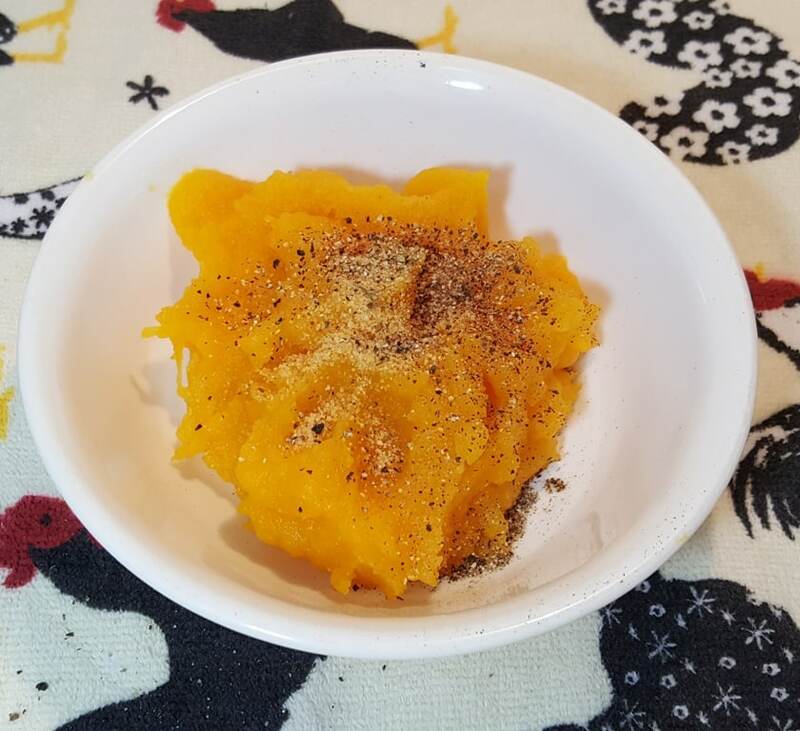 Mash pumpkin with 1 teaspoon curry powder, white pepper, nutmeg and sea salt. Mix in minced garlic. 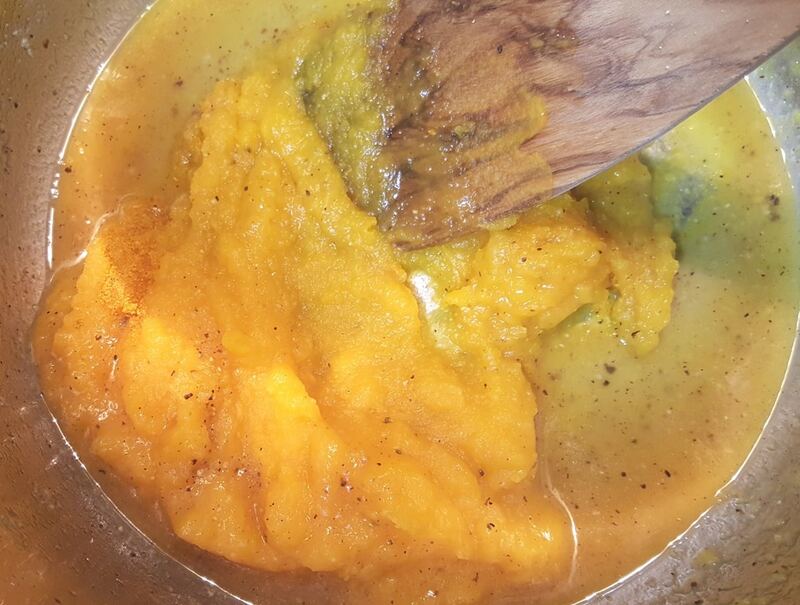 Add pumpkin mash to the Pressure Cooker cooking pot and cook for two minutes. Return chicken back to the Pressure Cooker and add maple syrup and 1.5 cups of chicken stock. If making this a One Pot Meal, add the Prepared PIP Rice now. Cook at High Pressure for 4 minutes. When Beep sounds, allow a 10 minute Natural Pressure Release. 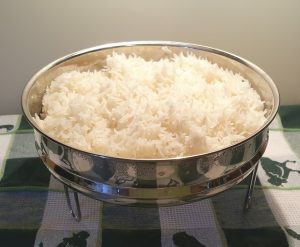 Remove rice and trivet. Quickly place cover on rice to finish steaming. Use the Saute/Browning button and reduce the liquid a bit. Taste and adjust seasonings as needed. Add in 2 teaspoons Garam Masala (or Cinnamon) and the coconut milk. 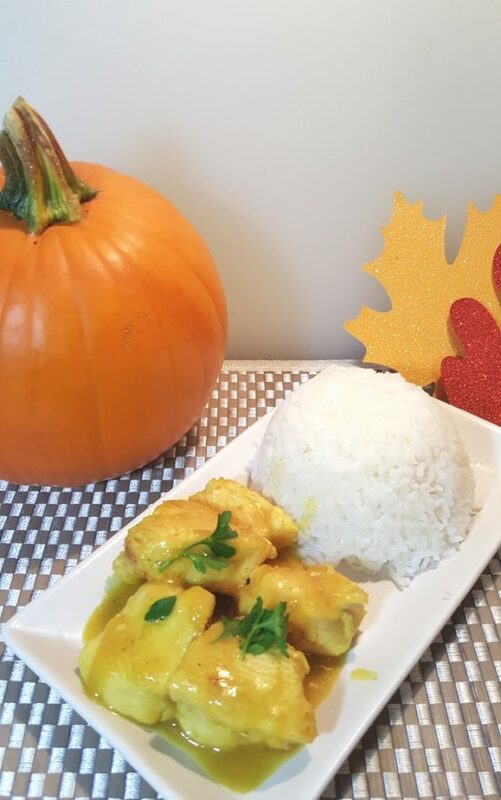 PIN this Pressure Cooker Pumpkin Curry Chicken! 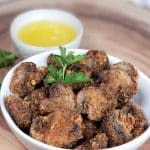 Could curry spice be used instead of leaves? And if yes, how much would you recommend? Also, it seems the link to the round stainless pan for doing the pot-in-pot takes us to small spicevtins… Would any stainless bowl/pan that fits in the IP also work? Maybe a springform pan with foil around it? Curry is fine. I show 2 teaspoons in the recipe. Other pans will work. I just like the flat bottom because of even cooking and I an get more in the pan since it is shorter, but wider.